...the answer is unfortunately NO: the new drains and tunnel are required to ensure that pollutants such as diesel do not get washed straight into the Ribble during rainfall, as rainfall will instead be channelled beneath the Ribble to a new treatment works in Penwortham where it will be cleaned up before being discharged into the River Ribble as clean water. 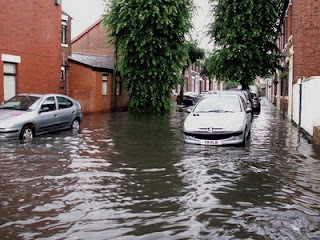 This is very good news for the Ribble's ecosystem, which is sensitive to pollutants and other changes to its delicate balance, but may not alleviate the occasional flash flooding Broadgate and Penwortham experience during heavy rain storms. A huge tunnel project which is intended to improve storm water overflow discharges into the River Ribble from Preston will be one of the topics under discussion at Preston City Council's next 'Central Area Forum' on Tuesday 24th March at the St Walburge's Parish Centre at 7pm. At the meeting, representatives of United Utilities will provide an overview of the project, and the public will be able to ask questions. The project will construct tunnels up to 100ft below the streets of Preston to hold excess rainwater during storms, several tunnel shafts, and over 5 kilometres of pipeline to transfer waste water underneath the River Ribble to a new pumping station which will be built in Penwortham, then back under the river to Clifton Marsh Water Treatment Works. The tunnels in Preston will follow the paths of existing roads and will not travel under buildings apart from those owned by United Utilities. Restoration will also be carried out after the underground work is complete. The main reason for the project is to improve the water quality of the River Ribble, as United Utilities Project Manager Andrew Kennedy exaplains: "This will provide great benefits to the estuary and bathing beaches as the quality of life for species on the Fylde coast improves." This is certainly great news for the River Ribble, although traffic disruption is expected while the work is carried out. Three shafts will be dug at Watery Lane, Marsh Lane and Fishergate Hill to allow digging machines to travel 26m underground to create a tunnel between the sites. From Preston the pipes will travel under the river to a new pumping station in Penwortham, before passing beneath farmland and the river to Clifton Marsh. The project has been planned to help the river comply with European legislation on bathing water quality. Once complete, improvements should be seen to shellfish waters along the estuary and to beaches at Southport, Ainsdale, St Annes and Blackpool. We will be asking what impact this project is expected to have on the local environment during the construction period. Coun Ken Hudson, leader of Preston Council, said benefits to the city and the river would outweigh any problems during construction. He said: "We don't like roadworks but it is essential the river is cleaned up and it may help tackle the algae at Preston Dock." Exactly how it may help the algae problem is another question we will be asking! United Utilities are intending to consult local residents about this scheme so more information should come to light over the coming months as Planning applications will be submitted to Lancashire County Council later this year and work is due to begin in the autumn. Click on Preston City Council's link for more information. and the Lancashire Evening Post. Preston City Council's Parks Department are looking for people who share a common interest in improving Fishwick Bottoms Local Nature Reserve and associated recreation ground. If you might be interested in getting involved with a Friends of Fishwick group, with an aim to work with Preston City Council Parks Department, and their partners, why not come along to a meeting to find out more. As a resident living close to the site, or someone with an interest in it, Preston Parks Department would like to invite you to a meeting at the YMCA centre on Samuel Street at 6pm on Wednesday 11th March. 6.40 Management of the site Matt Kelly Preston City Council. 7.50 Summary and date of next meeting.